A walking tour is the best way to explore Poland’s beautiful UNESCO-listed city of Torun. The pedestrianised old town makes it a place you can’t explore by car or bus. You won’t have to worry about navigating as your guide will lead the way and take you to multiple city highlights. 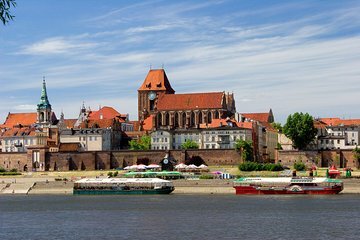 See the Main Square, the Town Hall, St. Mary’s Church, St. John’s Cathedral, and learn about one of Torun’s most famous past residents—Nicholas Copernicus. We are so glad we took this tour because our charming and knowledgeable guide, Magda, told us the history and stories that allowed us to more fully appreciate Toruń. Toruń is a charming city, beautiful and very easy to walk through. Magda and this tour made our visit more enjoyable and we highly recommend it to anyone.